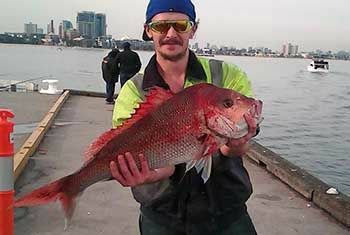 Andrew Pfeiler braved the cold conditions to catch his personal best Snapper. This 76cm and 5.5 kg Snapper was caught at Station Pier an hour before the rising tide. Fishing from the very end of station pier Andrew was using a Paternoster rig and Pilchards for choice of bait on a single hook. Thankfully for Andrew there was another angler with a large gaff that was able to help him land this monster fish especially when the big red went for a large run under the pier. It was Andrews 3rd ever legal Snapper so this is a very worthy upgrade. Well done Andrew and thanks heaps for the report.